"Four little girls from Ireland embarked with their widowed mother on a trip to Boston. Mother died in route so the 4 little girls were met by a Father John. He had a patent medicine going called 'Father Johns Cough Syrup'. he reared the girls and educated them in a convent. 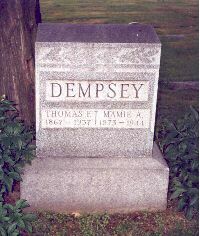 Their name was Dempsey." 2. Elizabeth Dempsey-Genevieve Mooneys grandmother whose married name was James Corcoran.